Home / Columns / The Golden Globes 2016! JM Looks At The Big Winners Of The Night! Highlights! Surprises And More! The Golden Globes just ended and I was talking with JM about the night. He did a great recap of what happened on the big night. I’m still a little shocked that the show aired on NBC even though NBC didn’t have any nominations. I love the irony! Check out JM’s recap below! 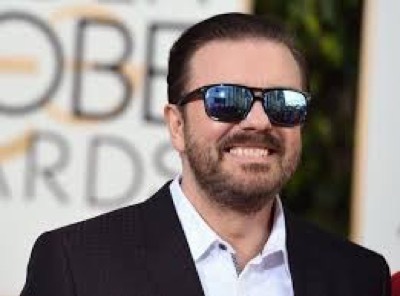 Ricky Gervais genuine obnoxious jokes prevailed once again at the Golden Globes and rest assured everyone from Caitlin Jenner to Bill Cosby received some jabs. If history has informed us, the Hollywood Foreign Press and its attendees at the Globes love the drinks to be free flowing at one of the most popular awards shows. “The Revenant” and “The Martian” were the biggest winners of the night, proving this upcoming Oscar season should certainly be entertaining to say the least. 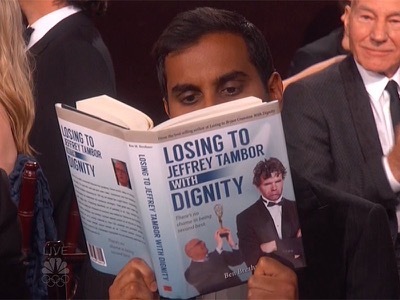 Like any awards ceremony, there were plenty of entertaining moments and fans who tuned in were certainly not disappointed like Aziz Ansari’s gag cutaway shot of losing, Leo’s look of Lady Gaga walking by or Mel Gibson’s comeback. Ricky Gervais’ playful jabs about Caitlin Jenner’s driving abilities kicked off the ceremony, but it was his drunken rips at Mel Gibson’s intoxicated past that contained the best zingers. Needless to say, Ricky curated an entertaining evening for film and TV talent in attendance. 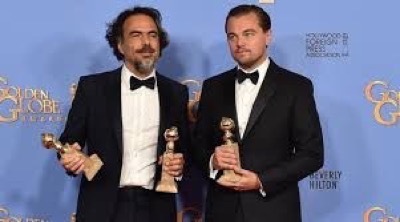 Leading all winners was “The Revenant,” which took home trophies for BEST DIRECTOR (Alejandro Inarritu), BEST ACTOR DRAMA (Leonardo DiCaprio) and BEST PICTURE DRAMA. The last two are quite important proving this might finally be the year Leo obtains his coveted and elusive Oscar statue. Sure, all awards pundits (and fans alike) maintain it’s a foregone conclusion Leo will win BEST ACTOR at the upcoming OSCARS, but this is just the first true confirmation it’s on track to actually happen. Additionally, winning over supposed frontrunner “Spotlight” plus highly coveted contenders “Mad Max: Fury Road” and “Carol,” just adds fuel to the fire the OSCARS’ BEST PICTURE is no longer a lock. 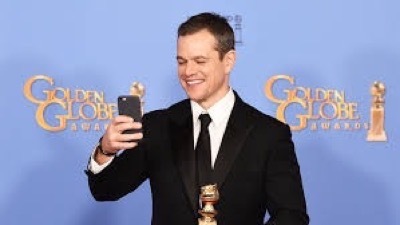 Matt Damon’s delightful and amazing performance in “The Martian” was rightly rewarded with BEST ACTOR in a “Comedy” film, which also won BEST PICTURE COMEDY. Although an obvious category fraud situation, this reinforces “The Martian’s” legitimacy for OSCARs beyond the technical categories. Overall, some awards regulars Kate Winslet (BEST SUPPORTING ACTRESS), Aaron Sorkin (BEST SCREENPLAY), and Jon Hamm (BEST TV ACTOR DRAMA) took home some hardware. Valentine’s Day! Pinky Shares Her Valentine’s Memories And Her Favorite Celebrity Valentine’s! Michael Fassbender! Orlando Bloom! Katy Perry! And More!